Beautiful new 3 bedroom, 2.5 bath contemporary home with butterfly roof in this close-in Greenwood Neighborhood. Close to shopping, bus lines downtown, coffee shops and movie theatres. Tons of natural light is found in this soaring ceiling open concept design. 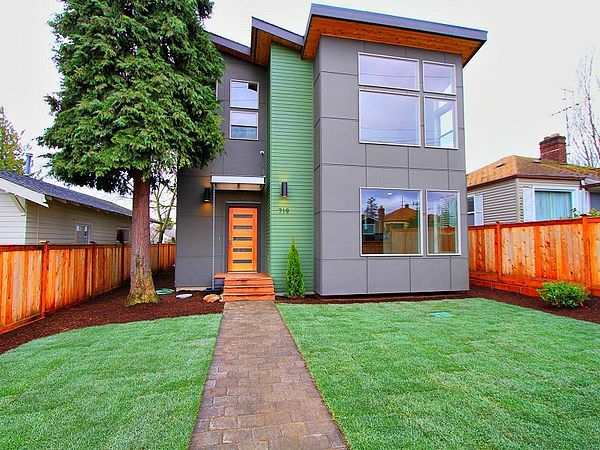 Ultra modern exterior design with stylish elevations, cantilevered walls make the home look like it's floating, extensive use of windows and high ceilings take the dreary out of Seattle's winter. Enter off the cool covered deck to a "great room" concept with a 3 sided fireplace separating the living and dining rooms. A spacious open kitchen with contemporary cabinet package and a handy island with white slab counter top. The perfect place for family and guests to hang out. There is also a half bath and an informal eating nook with french doors to a covered deck for year around barbecue's and access to the sunny, fenced back yard. Upstairs you will find 2 bedrooms plus the master bedroom with soaring 12 foot high vaulted wood ceilings, an awesome wall of windows, and a classic master bath with walk-in closet and a full tiled shower. The tile floors in the master bath are heated. The other 2 bedrooms share a beautiful full bath. The laundry room is also on this level. Take a moment to see the territorial views of the Olympics and the Cascades from this top of the hill location. You will enjoy the sought after 2 car garage with openers off of the alley. Whether you are looking for a change in address or a change in lifestyle, look no further than 719 No. 101st.